"If I could fly, I'd be the luckiest boy in the whole world." Before he became a movie and Saturday morning television star, Paul Reubens' Pee-Wee Herman character made his mark as the star of a live theater production called The Pee-Wee Herman Show. It was decidedly more adult in nature�though more sprinkled with innuendo than obscenity� and a dark step to the left compared to his mainstream persona. HBO recorded this filmed-live-at-The-Roxy version in September 1981, and it captured Reubens at his Puck-ish best, with just enough adult humor to make the whole kiddie show parody seem that much more wicked. The set is stripped down edition of what would eventually get the royal treatment on Saturday morning TV in 1986, and it features the familiar oddly angled doors and a bright wash of colors. There are characters here that eventually made onto Pee-Wee's Playhouse, such as cantankerous Kap'n Karl (Phil Hartman), the vivacious Miss Yvonne (Lynne Marie Stewart), the disembodied, all-knowing genie head Jambi (John Paragon), as well as non-human creations like Clocky and Pterry. Edie McClurg wanders in and out as wild-eyed Hermit Hattie, though her character doesn't seem to really mesh with the rest of the Playhouse crowd, and leftover cast members like Hammy (Tito Larriva) or The Jelly Donuts (Monica Ganas, Brian Seff) basically get similar solitary scenes before disappearing. The story concerns the unspoken attraction between Kap'n Karl and Miss Yvonne, and Pee-Wee's sacrificing of a very special wish in order to bring them together. And that description is almost giving this production more dramatic substance than it really has, because it's really just a fast-paced set of sometimes saucy gags, prop humor, and one-liners that play off Pee-Wee's man/boy character. The fact that it can veer into those taboo areas makes it seem nuttier than the TV show, and maybe just a little wrong. There are bits about shoe mirrors worn to look up the dress of Susan (Nicole Panter) and Pee-Wee sneaking a peak up Miss Yvonne's billowy gown. Jambi makes a vague masturbation joke and a hypnosis act involves a puppet and a woman removing her dress. And let's not forget the musical tribute to Sly Stone. Looking back, the naughtier pieces maybe seem naughtier just because Pee-Wee went to be a Saturday morning television star. If this is your first time seeing the live show, it may seem axis-tilting to see the humor stumble into areas that it never could during the Playhouse era, but for those of us who lived through this first, it made subsequent Pee-Wee seem like he could, at any moment, go bad. And that kind of weirdness lives here. Don't be a Mr. Bungle! Image Transfer Review: Issued in its original HBO-produced 1.33:1 fullframe aspect ratio, the transfer looks pretty solid for a television special from the early 1980s. Colors are bright, though edges seem a little soft and the print does carry some fine grain. Not immaculate, but for fans that have been eager for this, the treatment should suffice. Audio Transfer Review: Audio is presented in Dolby Digital mono, and voice quality is perfectly clear at all times, with no dominant hiss or distortion. It's a very basic, glitz-free operation, but the track carries the material without an overwhelming sense that it needs to be any stronger. Extras Review: No extras whatsover, with the exception of 15 chapter stops. But do chapters really count as extras? Consider this a long ago peek at Pee-Wee's dark side, a bit more risque and far more double-entendre driven than what I like to call "regular" Pee-Wee. It's the kind of bawdy, subversive humor that always seemed just below the surface on Pee-Wee's Playhouse, only here it's out in the open. 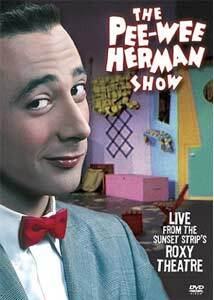 One of the missing "jewels" in the Pee-Wee DVD catalog, this live show stills delivers the laughs, ribald or not.